This is a 2 bedroom 2 bath "Abbey" model Veranda with den at Heritage Palms. This ground floor unit commands a lovely view of the golf course and lake. The den has doors and a sleeper sofa to use as a 3rd bedroom if needed. Beautifully decorated throughout. 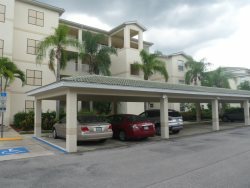 Enjoy relaxing or entertaining on either the screened lanai in back, or the veranda in the front of this unit. There is a single unattached garage. Full country club membership for a transfer fee affords all amenities including 36 holes of championship golf, 10 tennis courts, 8 heated swimming pools, lodge and club house. Heritage Palms Country Club is a gated community in Fort Myers, Florida that boasts a 28,400 square foot clubhouse with a picturesque view of the centrally located 38 acre lake. Within the clubhouse are restaurants offering formal and informal dining, locker rooms, pro shop, media room, heated swimming pools, and spa, cabana, lighted Har Tru tennis courts with stadium court and tennis center, fitness center, aqua range and putting and chipping practice greens. A grand entrance to Heritage Palms Country Club is one of the finest in Southwest Florida. The boulevard entrance focuses on a 12 foot high waterfall that cascades down to a rock pool. Cradled above the waterfall is the setting for one of the golf course tees. A palm lined inlet welcomes you at the entrance off Six Mile Cypress Parkway. Residents will enjoy views of manicured greens, tropical preserves and glimmering lakes throughout the community. Heritage Palms Country Club offers a variety of lifestyle options, including single family homes, twin villas, featuring single story residences with private pools and two car garages; two-story verandas with single car garages; and four-story terrace condominiums.